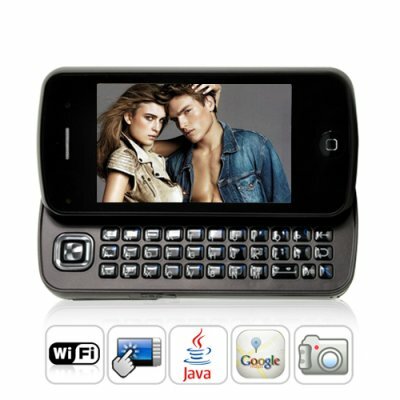 Successfully Added Tripoli WIFI Quadband Dual-SIM China Cell Phone (Keyboard) to your Shopping Cart. A top of the line cellphone for those who demand the very best - The unlocked Tripoli smartphone has it all! WIFI, quad-band GSM, dual-SIM, camcorder + multimedia mastery, PDA, and so much more. A smartphone in every sense of the word! The design philosophy behind The Tripoli is Innovation Intelligence. In practical terms this means adapting the best technologies from today's hottest cellphones and incorporating it into one mobile phone with the power to empower its owner! Citius, Altius, Fortius! Faster, Higher, Stronger! Yes, The Tripoli effortlessly brings together the hottest features from today's most popular phones like the Apple iPhone 3GS, the Nokia N97, as well as the cutting edge Sony Ericsson line of camera phones! Take this phone for a test drive and your first impression will be WOW! What's not to love? Its tiltable and ultra-responsive touchscreen, its innovative menu system and well-designed keyboard, and its sliding camera cover to keep the lens protected for remarkable photos everytime! But that's only the beginning! For The Tripoli embodies both functional core excellence along with tons of extra features to truly get excited about. In practical terms, The Tripoli excels with quad-band GSM compatibility (850MHz, 900MHz, 1800MHz, 1900MHz) and dual-SIM support, along with WIFI for free Internet access wherever a wireless hotspot is available. In terms of exciting extras, this phone comes with a front and rear 1.9 MP digital camera / camcorder, an MP3/MP4 player, JAVA support, an iPhone-like accelerometer - The Tripoli even has a electronic compass! Once you're done being amazed at what this phone can do, continue your disbelief in regards to its astonishingly low price! Feature for feature, expect to pay 2-3 times more for a similar phone elsewhere! As leaders of online China wholesale electronics, Chinavasion has the market presence to bring you the best for the least everytime! Be smart, add to cart - today! Plays RM Real Media files! Mobile Office software that can view Microsoft Word (.DOC) and Microsoft Excel (.XLS) files. I bought this phone last August (2010) it's a very robust phone for everyday use. The phone is a little to big for a Lady but for a worker this is a real good one. The keyboard is really easy to use also for big fingers. It feel good in your hands during a call. The keyboard is good and lasting. Bluetooth works perfectly with every headset i tried and also with every phone and computer. Auto switching (Headset to internal speaker works perfect). WiFi no problem, works perfectly. The handling of the two simcards is perfect. Including telefonbook. Radio is okay with the integrated antenna. TV is only Analog so i can't use it here in Germany. Awesome buy very very happy with it all my friends are jealous. This is a team almost complete, and would be completed even if she could edit Word, Excel, PowerPoint and PDF. on 2010-07-10 12:05:46 Es una belleza este equipo móbil. Este es un equipo que tiene mucho que dar, siempre busqué así, y aún es mi deseo que pueda editar todo lo que sea office y pdf. This phone is excellent value for money, and though it has some weaknesses, its strong features easily outweigh these to make it a must buy. So if you are considering this to be your first 'cheap (but excellent) Chinese smartphone, and you can't afford an iPhone/Android phone, then you will not be disappointed buying this..................... Continued. [Chinavasion Editor: Dear Phone Reviewer, Thank you for your detailed and extensive review. As the review provided was extensive and exceeds the number of words permitted for the product description page, we have there-fore dedicated a link for the review at, http://blog.chinavasion.com/index.php/5577/real-chinavasion-reviews-in-depth-customer-product-analysis#tripoli-July-10/ ].